This weekend saw one of the best goals the Premier League has ever seen and a definite contender for goal of the season. Wayne Rooney’s strike from the half way line against West Ham was nothing short of awe inspiring and when the camera panned to former Manchester United legend David Beckham to see his shocked and surprised look on his face, I think it is fair to say that Rooney’s goal was something very special indeed. To make the goal seem even more impressive, it happened within the first 10 minutes of the match at Upton Park. The audacity and confidence it must take to go for and consequently succeed in a 59-yard volley. This goal immediately halts any speculation that Rooney has lost some of his previous skill and ability and still proves that he is the best player they we have got. The 2-0 win over West Ham Saturday night was Manchester United’s 15th win of the season and Rooney’s thirteenth goal making him the second highest English goal scorer this season. 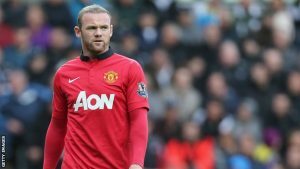 I think it is safe to say that Manchester United have been completely useless without the likes of Rooney in full form and he has definitely been the reason why Manchester United have still got an outside chance to reach the champions league for next season and why David Moyes has still got his job as the manager of United. As well as the league, Manchester United were very impressive when the beat Olympiakos to progress in the tournament and once again, it was Rooney leading the way along with Robin Van Persie who was able to get the hat trick. United will face European champions Bayern Munich in the quarter finals and without a doubt have the hardest task out of all the quarter finalists if they think they can make it through, especially with Van Persie injured for both legs. This means that Rooney is going to have to be at the peak of his levels and in outstanding form if United want to have a chance of beating the European Champions. Some have already written United off but if Rooney and the rest of the team have the best two games of their careers they might just do it. I made an audacious assumption before their first leg with Olympiakos saying that United could emulate the 2005 Liverpool team who were the underdogs throughout the tournament and managed to beat European giants AC Milan in what is regarded as one of the best Champions League finals ever to have been played. After their impressive 3-0 win to make it to the quarter finals, I thought it could happen, but now facing the likes of Bayern Munich I think it is very unlikely but may still happen. With the World Cup just four months away now and with England in possibly the toughest group, once again Rooney is going to have to be in the form of his life to be able to guide England through the tournament and get us as far as we the fans believe we can make. Rooney is definitely the best player to play for England in a long time but in my opinion has never been able to really prove his ability on the international stage. But with England rapidly developing into a strong side, Rooney has the chance to be one of the players of the tournament and maybe even guide us to the World Cup. Previous articleHave Chelsea finally found Claude Makelele’s successor in Nemanja Matic?